"A tessellation is created when a shape is repeated over and over again covering a plane without any gaps or overlaps." M. C. Escher, Reptiles, Lithograph, 1943. Click for the full size image. Maurits Cornelis Escher (1898-1972) is a graphic artist known for his art tessellations. His art is enjoyed by millions of people all over the world. He created visual riddles, playing with the pictorially logical and the visually impossible. He is most famous for his so-called "impossible structures", such as Ascending and Descending, Relativity, his Transformation Prints, such as Metamorphosis I, Metamorphosis II and Metamorphosis III, Sky & Water I or Reptiles. What made Escher's pictures so appealing was that he used tessellations to create optical illusions. He also gave them depth by adding shade. M.C. Escher, during his lifetime, made 448 lithographs, woodcuts and wood engravings and over 2000 drawings and sketches [You can buy a book at the bottom of this page that includes them all]. Like some of his famous predecessors, - Michelangelo, Leonardo da Vinci, Dürer and Holbein-, M.C. Escher was left-handed. M.C. Escher illustrated books, designed tapestries, postage stamps and murals. He was born in Leeuwarden, the Netherlands, as the fourth and youngest son of a civil engineer. After finishing school, he traveled extensively through Italy, where he met his wife Jetta Umiker. They settled in Rome, where they stayed until 1935. During these 11 years, Escher would travel each year throughout Italy, drawing and sketching for the various prints he would make when he returned home. Many of these sketches he would later use for various other lithographs and/or woodcuts and wood engravings. He played with architecture, perspective and impossible spaces. His art continues to amaze and wonder millions of people all over the world. In his work we recognize his keen observation of the world around us and the expressions of his own fantasies. M.C. Escher shows us that reality is wondrous, comprehensible and fascinating. Examining one of his woodcuts, Sky & Water I (left above), we see fish in the sea and as you go up, the space between the fish transform into black ducks. The tessellations are the fish shapes in white next to the duck shapes in white. Technically, the shapes at the top and bottom of his woodcut are no longer tessellations because they spread apart and the space around them no longer resemble fish or ducks. Robert Fathauer stands next to his art, "Twice iterated Knot." He entered this in the American Mathematical Society Exhibition. Robert Fathauer, born in 1960, creates his tessellations using a computer. Robert has an interest in mathematics and art and has been a great fan of Escher. Robert Fathauer received his doctorate from Cornell University in Electrical Engineering and joined the research staff of the Jet Propulsion Laboratory in Pasadena, California. Later in 1993 he founded his own company called Tessellations to produce tessellation puzzles and offer them for sale. 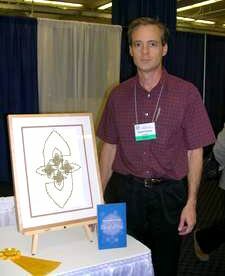 Dr. Fathauer now promotes mathematical art at exhibitions and conferences. His products look excellent for any classroom teacher. Some people say that he is the expert in recreational math. 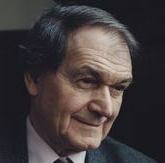 Roger Penrose, a professor of mathematics at the University of Oxford in England, pursues an active interest in recreational math which he shared with his father. While most of his work pertains to relativity theory and quantum physics, he is fascinated with a field of geometry known as tessellation, the covering of a surface with tiles of prescribed shapes. Penrose received his Ph.D. at Cambridge in algebraic geometry. While there, he began playing with geometric puzzles and tessellations. Penrose began to work on the problem of whether a set of shapes could be found which would tile a surface but without generating a repeating pattern (known as quasi-symmetry). "Eventually Penrose found a solution to the problem but it required many thousands of different shapes. After years of research and careful study, he successfully reduced the number to six and later down to an incredible two." He called these shapes Penrose tiles. Believe it or not, but the shapes he came up with are like the chemical substances that form crystals in a quasi-periodic manner. Not only that, but these quasi-crystals make excellent non-scratch coating for frying pans. Penrose and Escher have been influences on each other. Penrose first met Escher at the International Congress of Mathematicians in Amsterdam. Penrose saw some of Escher's work there and began playing with tessellations and came up with what he calls a tri-bar. A tri-bar is a triangle that looks like a three-dimensional object, but could not possibly be three-dimensional in real life. He published his work in the British Journal of Psychology. Escher read his article. Triangles, squares and hexagons are the only regular shapes which tessellate by themselves. If you put many of these shapes together side-by-side, they form a tessellation. You can have other tessellations of regular shapes if you use more than one type of shape. You can even tessellate pentagons, but they won't be regular ones. On the left you see an animated pegasus image that illustrates perfectly how Escher achieved the tessellations through congruent shapes on each side. 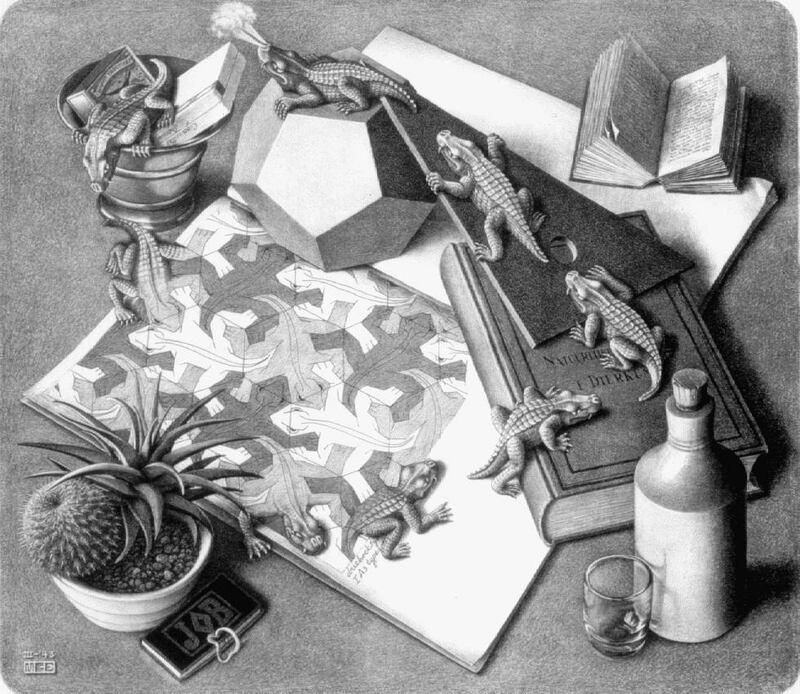 Jill has used this animated GIF image to show us how Escher accomplished this task. Definitions: "A fractal is "a rough or fragmented geometric shape that can be split into parts, each of which is (at least approximately) a reduced-size copy of the whole ..."
"A fractal is an object or quantity that displays self-similarity, in a somewhat technical sense, on all scales." "Fractals are endlessly repeating patterns that vary according to a set formula, a mixture of art and geometry. Fractals are any pattern that reveals greater complexity as it is enlarged." This fractal was created by Melissa D. Binde. Her website is no longer online. As you can see, there is an increasing level of complexity. The black space on the right become fractals themselves. How Are Tessellations and Fractals Alike and Different? Both tessellations and fractals involve the combination of mathematics and art. Both involve shapes on a plane. Sometimes fractals have the same shapes no matter how enlarged they become. We call this self-similarity. Tessellations and fractals that are self-similar have repeating geometric shapes. Tessellations repeat geometric shapes that touch each other on a plane. Many fractals repeat shapes that have hundreds and thousands of different shapes of complexity. The space around the shapes sometimes, but not always become shapes in the design. The space around shapes in tessellations become repeating shapes themselves and play a major part in the design. Final Project - This is a college-level using computer graphics. Fractals - A unit for elementary and middle school aged students. Escher in the Classroom - Examining Escher's work and lessons by math teacher Jill Britton. This is an excellent site!! Symmetry and Tessellations - This page includes 30 lessons and activities. Tessellation Lesson [Archive] - Integrating Math and Art using a computer. This page is created by North Carolina art teacher, Carolyn Roberts. Penrose Stamps- An excellent tutorial on creating Penrose tile stamps. Fractal Animations - You can see the fractals move on this page. Fractal Foundation - They've taught fractals to over 68,000 children and 50,000 adults. Fractals Unleashed [Archive] - They describe themselves as the most comprehensive site about fractals on the web. 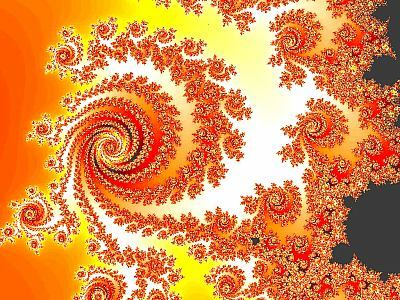 The Fractory [Archive] - This ThinkQuest site shows you what fractals are and how to design them. Interactive Tessellate! - Create your own tessellations online! You can also make one here and here. This one is more extensive and powerful. Tessellation artist also has an online tessellation creator. Intriguing Tessellations - This is a site by Marjorie Rice. Lifelike Tesselations - This is an excellent site that has a gallery of art. Mrs. Sulik's Fifth Grade Math Class [Archive] - This page includes student tessellation pictures. Tessellations are a great way to integrate art and mathematics! Pixzii [Archive] - You can see similar images in photographs. In this case the illusion called the Droste Effect. Student Tessellations - This page has several links to student tessellation pictures. Totally Tessellated [Archive] - A great ThinkQuest site. Tessellations - This site has free samples and guides. Tessellations - This is a page by college professor Annette Lamb. Tessellations.org - You can find just about anything here. Tessellation Tutorials - This page is by Suzanne Alejandre. Tessellations Step-By-Step (Archive)- This page shows you how to create tessellations with Paintbrush or Paint applications that come standard with most computers. The World of Escher - You can buy things or view a gallery of tessellations. Buy the M. C. Escher Metamorphosis Tie! See also this tie . Introduction to Tessellations - This clear introduction to tessellations and other intriguing geometric designs help students explore polygons, regular polygons and combinations of regular polygons, Escher-type tessellations, Islamic art designs, and tessellating letters. Designing Tessellations : The Secrets of Interlocking Patterns - Inspired by artist M. C. Escher, Jinny Beyer introduces quilters to the fascinating world of symmetry and then clearly shows how to experiment with shapes and images to create sensational, tessellating designs. The Magic Mirror of M.C. Escher - Escher was a master of the third dimension. Mathematician Bruno Ernst is stressing the magic spell Escher's work invariably casts on those who see it. Ernst visited Escher every week for a year, systematically talking through his entire aeuvre with him. M.C. Escher: His Life and Complete Graphic Work - Illustrated are 448 (of the 449) original woodcuts, wood engravings, lithographs, linocuts and mezzotints by Maurits Cornelis Escher. M. C. Escher - Renowned artist M.C. Escher is not a surrealist drawing us into his dream world, but an architect of perfectly impossible worlds who presents the structurally unthinkable as though it were a law of nature. Origami Tessellations: Awe-Inspiring Geometric Designs - In this book, Eric Gjerde presents easy-to-follow instructions that introduce the reader to the incredible beauty and diversity of origami tessellations. Mosaic and Tessellated Patterns: How to Create Them - This book introduces the basic types of tessellations and presents many examples. Tessellations: How to Create Them [VHS] - The 27-minute DVD breaks down the mystery of creating tessellations into simple steps. Art In The Classroom Series: Tessellations - Students discover how to create amazing patterns by sliding, rotating and flipping shapes, and by contrasting colors. Magnetic Tessellation Puzzle - Each of the four shapes in this set can be transformed into a different geometric shape.